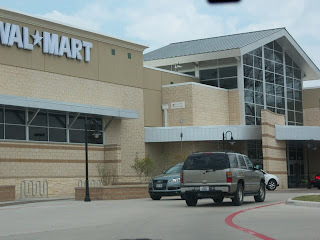 The color scheme of the Wal-Mart Supercenter is made to match all the other shops in my hometown which match all the other shops in all the other suburbs in all of America. With apologies for my more infrequent posting, most of you understand I've had my reasons. Mama is sick and first-born Robert needs to be home. And so I'm home. Sorta. I mean, when I left this town nearly twelve years ago, it was already suburbia. Since then, it has become "stylish suburbia". Though I surmise that it's only stylish to those who feel that places like Southlake, Frisco, and Plano somehow represent some sort of white flight manifest destiny. Anyway, I'm where I need to be, where I must be for a variety of reasons. But it doesn't mean I'm not prone to missing all of the things about my beloved home in Oklahoma--most notably my friends. Because I have to be around the house a great deal to care for my mother and stepfather, I can't get out much. Which is fine since I only have a small, small number of friends in this area who actually will get out. So I suppose the biggest change is that I'm alone a lot more with more time to think, read, write, etc. The only problem is that I haven't been writing and reading nearly as much as I'd like and I've been thinking way too much. So in lieu of many other options, I take a drive down memory lane as often as I can--almost quite literally. Though much of the landscape has changed and morphed into suburban excess, I take my mp3 player and just drive. Past my old high school. Through the older parts of town. Through my old pizza delivery routes that I've nearly memorized. It's not like I necessarily love these places, but I do find the familiarity comforting in an uncomfortable time. So for this week, I created a playlist of some of my favorite tracks I used to drive around to when I was in high school--so all are from 1998 and before. 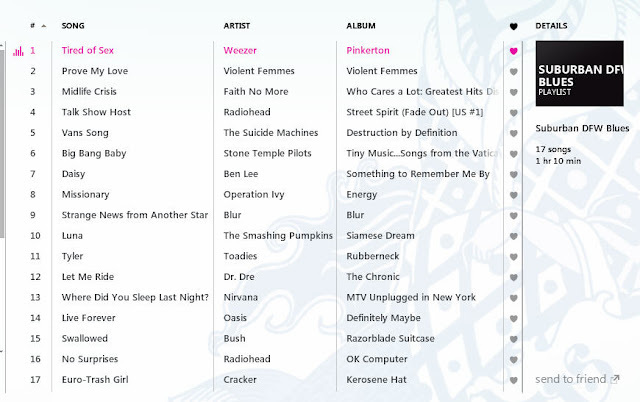 These aren't necessarily my favorite songs of all time. But they are an honest reflection of what I was listening to back then/what songs trigger memories about my life in the late 90's (honest meaning I may be slightly embarrassed by a couple of the selections, but I'm all about full disclosure on this blog, eh?). Also, I extended the list from the normal dozen to seventeen because A) I am behind on weekly playlists and owe you, the devoted reader(s) oh so sweetly and forcefully and B) because I had a hard time only picking twelve. So enjoy. And think a good little thought for your good buddy Rob and his family. Or a dirty thought. Whatever suits you. Trips down memory lane are good for the soul sometimes, especially when accompanied by an old school track list. Cancer is a tough journey, but I'm glad that you and your Mom are surrounded by the love and support of friends and family (and good doctors). Is that Zune software? I love my 32gb Zune HD.